Introduced at ’Fynske Øldage’ 2005. 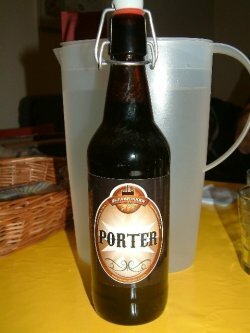 English: A dark and rich porter inspired by the Baltic porters traditionally made in Scandinavia. Roasted without being burned or bitter, with the flavor dominated by dried fruits and vinous notes. High amounts of residual sugars and a fruity aroma makes this beer the perfect companion for chocolate desserts, if served lightly chilled. Brewed on Maris Otter ale malt, British Brown Malt, chocolate malt, roasted barley, two types of caramel malt and brown sugar. This Porter is black in color and pours less than half an inch of light-brown head that settles to a bubbly sheet and ring. The nose is smoky and roasty with notes of coffee, blackstrap molasses, burnt toast, dark chocolate, and bacon. On the palate, there are flavors of dark chocolate, cocoa, prune, coffee, smoke, grilled meat, and a touch of ashiness in the finish. It's quite sweet, but the moderately dark roastiness and subsequent moderate bitterness help to offset all that sweetness. The beer is full bodied, medium-minus in carbonation, and smooth on the palate. Overall, this is an enjoyable, fairly complex Porter with a nice smoky and earthy character. Black, beige head. Aroma has licorice, coffee, cocoa-like boozy notes. Thick, creamy mouthfeel, almost chewie. Coffee, licorice and chocolate. Sweet with licorice bitterness and smooth, warming alcohol. 3 years past BBD but still (I guess) with all the flavours intact. Very nice. Thanks MiP. Bottle. Pours cloudy dark brown with airy tan head. Clear aroma of roast and chocolate, with roasty notes and touches of yeast. Bitter and roasty flavour with notes of coffee, chocolate and liquorice and touches of hops and malt. Lingering, roasty, coffeelike aftertaste with notes of hops. Well-balanced and delicious. Fantastic. A splendid BP! 3 years past the BBD and still going strong! Although a dark brown and very dense foam located close to the top of the thick coal-black porter. It hangs fat on the inside of the glass and reminiscent of an oily substance. The aroma is coffee and licorice, while the taste varies over dark bitter chocolate, lots of strong coffee and English licorice. It is a sovereign delicious porter. Sweetish-Malty beginning. Intense malty with a very sticky sweetish body. Hints of sourness, intense sweetish with roasty coffee-like aroma. Sweetish-malty aftertaste, fresh but sticky, intense. Nice! "Wish list brew from john. Loved the frosted and surprisingly choppy aroma. Licorice, chocolate, smoke...lots going on, and all very good. But not Wow good, so methinks 64th is a bit on the high side.